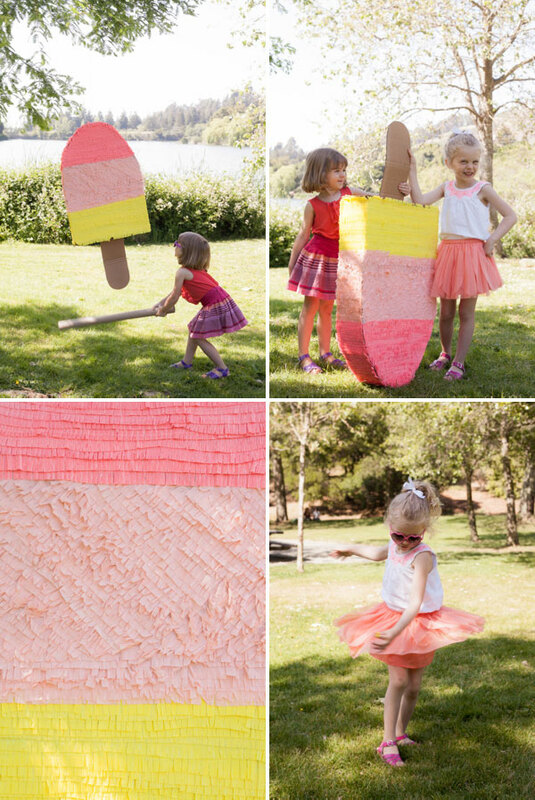 Step 1: Gather two pieces of cardboard of equal size and draw the shape of a popsicle on each. 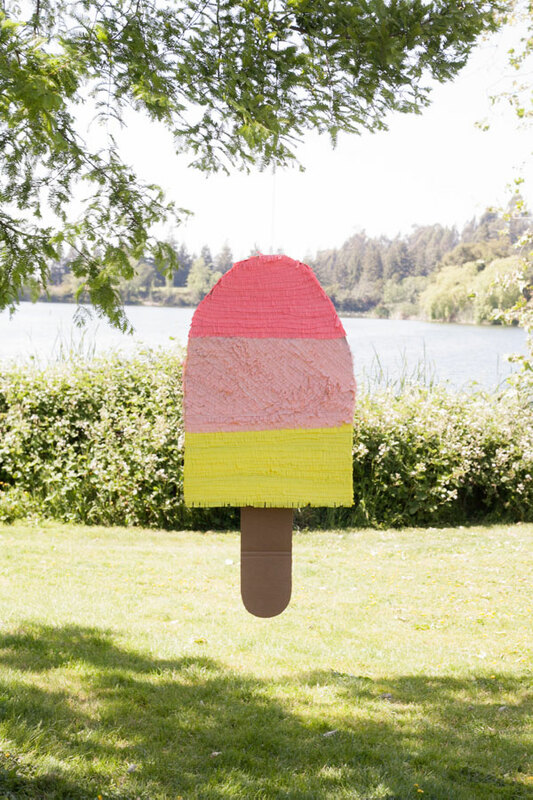 Step 3: Cut several 6″ wide strips of cardboard to make the sides of the popsicle. Step 4: Fold the cardboard incrementally to allow it to bend along the curved top of the popsicle. 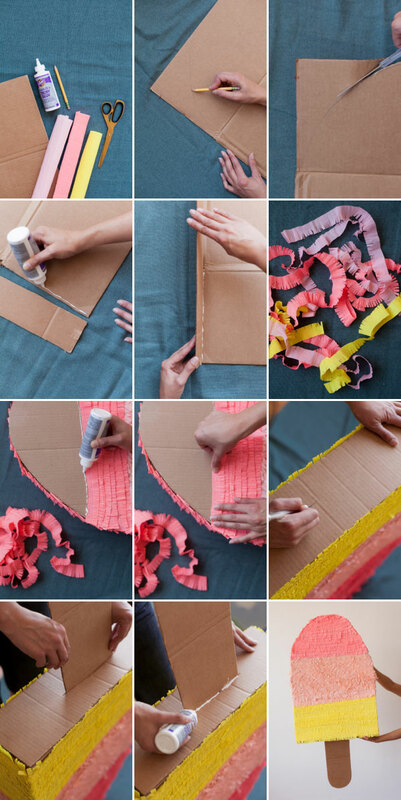 Step 5: Glue the folded strips of cardboard to the popsicle shapes to create the walls. Hold in place and allow to dry. Step 6: Glue the second popsicle shape to the top of the now dry walls. Step 7: Cut the crepe paper into 3/4″ strips. Step 8: Cut the fringe out of crepe paper. 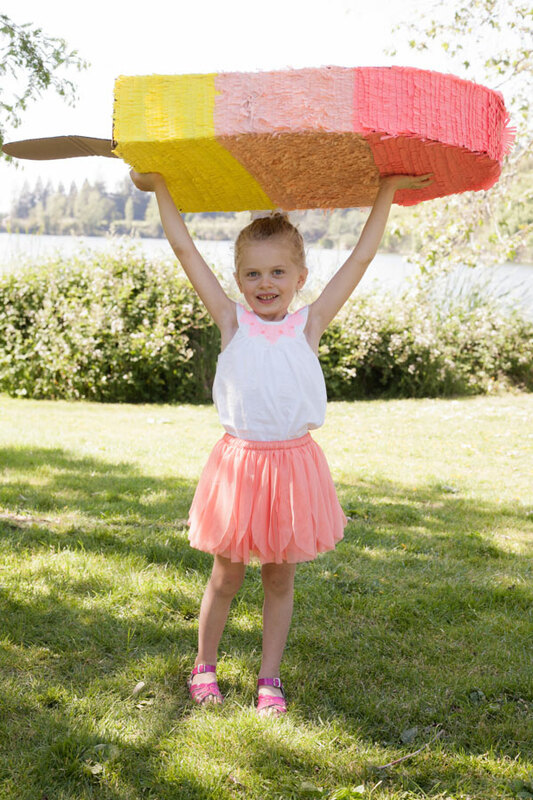 Step 9: Glue the fringe to the popsicle – Start at the bottom and work upwards. We also used three colors of fringe. Step 10: Pay special attention to the last row of fringe. The secret to a nice looking piñata is all in how you apply the last row. Glue this row over the edge so that it is on the top and front surfaces. Step 11: Cut a rectangle shape out of cardboard. Curve the edges of one side so it looks like a popsicle stick. Step 12: Use your X-Acto knife to make an incision on the bottom of the popsicle. Step 13: Push the square end of the rectangle into the incision you just made and glue in place. Step 14: Fill with treats and enjoy! Great colors for the popsicle. Yes to the contest! 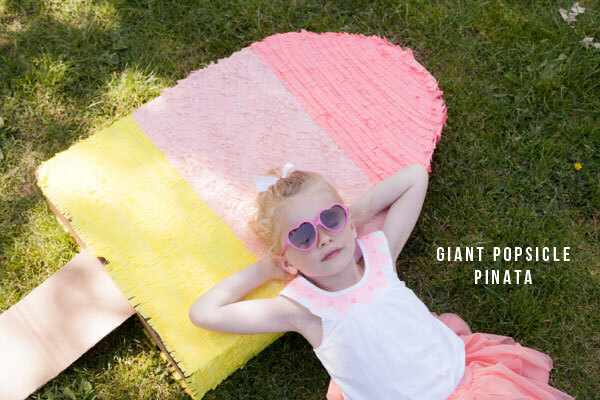 You’ve inspired so many pretty pinatas – would be fun to see them all in one place! p.s. I want to make a pinata! Let me know if you have a contest – this would be so much fun! Just when I thought you couldn’t impress me more you go and out do yourself with another pinata creation. Would love to live in your head for a while! It´s so cute!!!! we love it! For our photography sessions it´s perfect!!!! this is ADORABLE!!!! ok. i think i need to make a frigging pinata already!!! WOW. Just WOW. Can I get a real ice cream that size, please?